For a limited time only! Click the black button below to order 4 of this product, but pay for only 3. 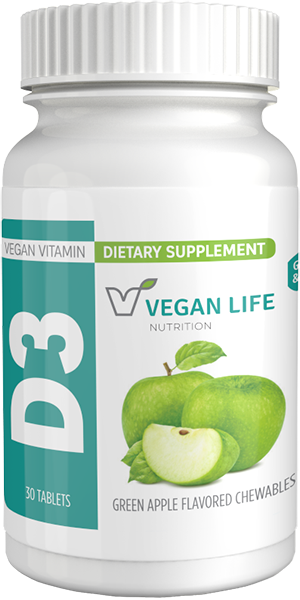 Made with VitaShine, this exclusive VEGAN VITAMIN D3 provides a full daily dose of Vitamin D3 suitable for both vegan and vegetarian consumers. 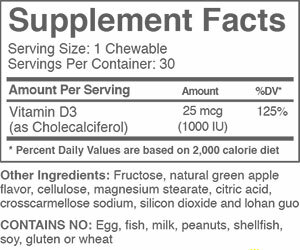 A truly vegan vitamin D3 in a delicious, green apple-flavored chewable tablet! Unlike other sources of Vitamin D3 in the market, which come from sheep’s wool grease, our Vitamin D3 is sourced from Lichen, a plant-like moss. This is the only Vitamin D3 which has been approved by the UK Vegan Society. It provides all of the health benefits of standard Vitamin D3, but is sourced from healthy and naturally grown plants. Each gummy contains 1000 IU of Vitamin D3, 30 tablets per bottle. "I have used your ThreeLac product and, I like it very much. The customer service dept. is excellent. This time I tried the ThreeLac Caps and I do like them, even though they are not lemon flavored. Thanks!!!" "I decided to try the FiveLac product. I've been using it about one week now and I've seen tremendous improvement in my body. No more itching, no more IBS, no more bloating, no more cravings (that's my favorite change). HIGHLY RECOMMEND this product."